So I’ve been reading Geoffrey of Monmouth. (Yes, yes, I know you’re jealous. What better on a gorgeous summer day than a little 12th century history text?!) My motive for reading good old Geoffrey is another story entirely, and not that interesting. But the reason that I bring this up is that yesterday I ran across a passage about King Arthur which was just so poignant I needed to share it with y’all. You forgot to mention his mace, Bob, and his shield, Herman. Rebekah, where is that beautiful picture from? It would be perfect for my friend’s nursery! Hi Bethany – it’s a painting by N.C. Wyeth …. 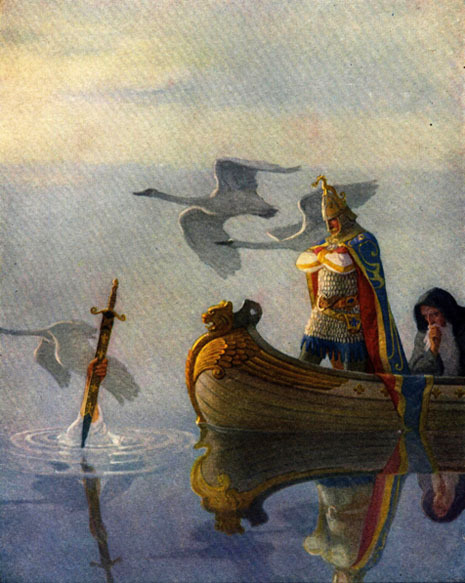 and you can almost never go wrong with a N.C. Wyeth print! Here’s a link to some of his posters: http://www.art.com/gallery/id–a34218/newell-convers-wyeth-posters.htm He’s got some great children’s illustrations! It would be hard to be slaughtered by a Ron. I chuckle because we have had dolls about our house named Leftover Omelet, Compost Baby, and Maggot Baby. It was when my son named his superhero action figure “Eyeball Hello” that I realized why Adam noticed that he needed a helper after God gave him the job of naming animals. And Brittany, you’ll notice that Eve named the children! Bekah, snicker is right! Too funny. Brittany, thanks for your comment. It was a wonderful addition to this post!